As soon as you have multiple colleagues helping to process incoming insights, chances are you'll end up using different terminology at times to describe similar feature ideas, which can result in redundancies. 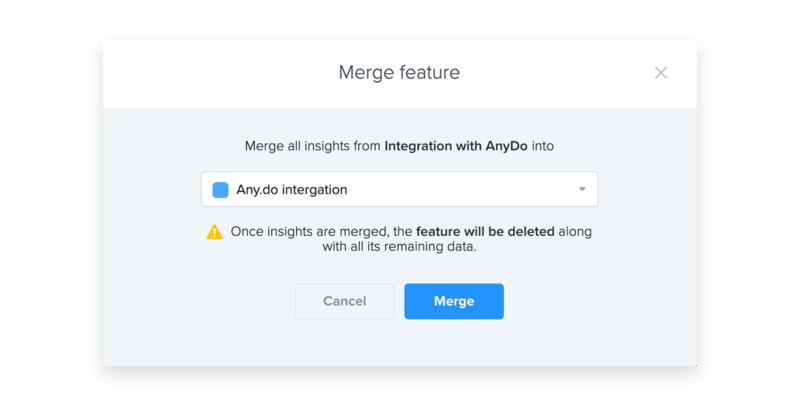 When you discover a redundant feature that should be merged into another, use the Merge function to rapidly move all of that feature's linked insights to the target feature. Once insights are moved, the initial feature will be deleted along with all other data associated with it (description, drivers, comments, etc.) Before merging, it's best to double check whether any of that information should be manually copied over to the new feature. It is also possible to merge subfeatures with other subfeatures. It is not possible to merge a feature that has underlying subfeatures.